Hello Everyone. . . Welcome to SandiesKorner this Saturday morning. The sun was up when I got up this morning but the clouds have moved in. It's looks like more rain. OMG we are so soggy now. I received my new rubber yesterday, so be sure and check in for some new projects and ideas. 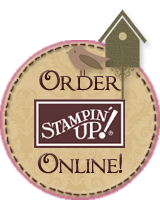 Stampin' Up is heading into an exciting time, with the release of the Last Chance List (Jun 1st) and the new 2011-2012 Idea Book and Catty the 1st of July. For the next month I will be trying to use up many of the products that are no longer available to make room for the new. So just sit back and enjoy the projects and hopefully will give you some ideas and inspiration on how you can use that product too. Today I have a card to share using the stamp set Butterfly Prints. I just love this set. It is so versatile. My cardbase is Very Vanilla, mixed with some retired designer papers. For the first time I used some of our retired Pom Pom trim. It's smaller than I envisioned, but oh so cute. If you have any questions on this card please drop me a note. I'll be ordering new catalogs on Jun 1st, If you would like to have one please send me an email with your name and address. US only. Catty's are FREE but there will be a $6. shipping fee.